Leaders of the Conference of Presidents commend Guatemalan President Jimmy Morales for announcing embassy move. Leaders of the Conference of Presidents of Major American Jewish Organizations on Tuesday commended Guatemalan President Jimmy Morales in the wake of his announcement that his country would move its embassy in Israel to Jerusalem. The leaders welcomed reports that several other countries including the Philippines, Romania, the Czech Republic and Honduras are among those also considering relocating their embassies to Israel’s capital. Greenberg and Hoenlein called on Palestinian Authority (PA) chairman Mahmoud Abbas “to come to the table and to stop the intensified campaign of incitement against the U.S. and Israel of recent days." On Sunday, Morales announced on Facebook that he had given orders to move the Guatemalan embassy in Israel from Tel Aviv to Jerusalem. 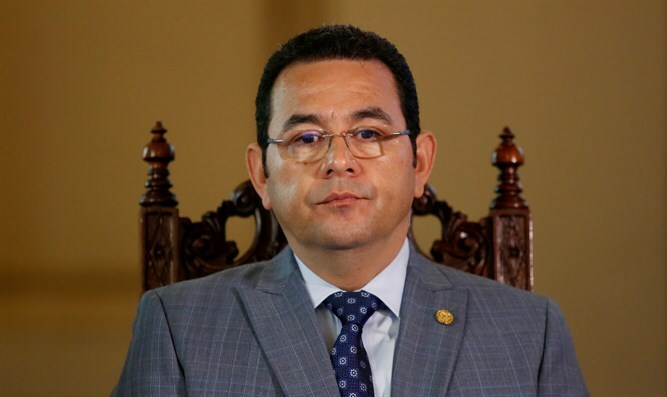 Guatemala’s Foreign Ministry acknowledged on Monday that it had received Morales’s order and was starting the process of moving the embassy to Jerusalem. Prime Minister Binyamin Netanyahu hailed Guatemala’s decision, saying other nations would also follow Washington's lead. "Other countries will recognize Jerusalem and announce the relocation of their embassies. A second country did it and I repeat it: there will be others, it's just the start and it's important," Netanyahu said in a statement. "We are waiting for you here in Jerusalem," Netanyahu told Morales.